NOW Solutions Ultrasonic Glass Swirl USB Oil Diffuser is the perfect marriage of function and form. 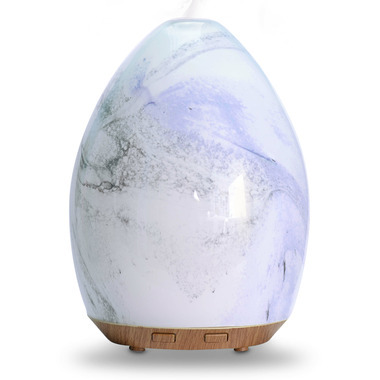 This diffuser will create a calming environment while looking elegant and timeless. NOW Solutions Ultrasonic Glass Swirl USB Oil Diffuser unites scientific innovation with the timeless tradition of aromatherapy to create a BPA-free diffuser that uses only tap water and your favourite essential oils. Instead of heat, this contemporary diffuser utilizes high frequency ultrasonic electrical vibrations to create an ultra-fine mist, which helps to maintain essential oil integrity and holistic properties. With an automatic shut-off and up to five hours of whisper-quiet operation, this attractive diffuser with rotating colours complements your healthy lifestyle and is ideal for home and office. Water Capacity: 60 ml / 2.03 fl. oz.